Actual reviews left in our guest book. "Absolutely a wonderful vacation! Beautiful landscapes, relaxing atmosphere. Loved the house - it made our stay. We will be back. Thank you so much!" "...it was great to have all the space to relax after a long day. It made it much easier to feel like home. We thoroughly enjoyed the history left about the home. What a great idea to have this home. Thanks for your hospitality." "Had an amazing time here. Beautiful house and yard! Really enjoyed the front yard. Very relaxing. Will definitely be back next year." "Had a great time. Very relaxing and comfortable. Spent most of our time on the beautiful front lawn. Will absolutely be back next year." "A great place to stay with all the comforts of home. 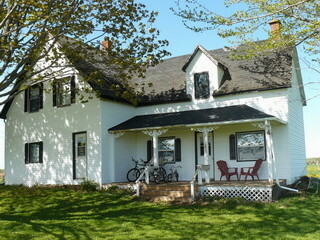 A great base to see many attractions in PEI. Cathy and Mark, thanks for the fantastic opportunity. We had a wonderful time and would recommend the Condon Homestead to anyone." "We thoroughly enjoyed our stay at the Condon Homestead. No doubt we will stay next time we are back in PEI. Thank you Cathy and Mark for the concept." BACK to main information page.